The Carnevale di Follonica is an important event in the annual festivities of the town and fills the place with colour, music, and costumed and masked local people (Maremmani) from the surrounding villages and towns. The carnival activities are held every year usually (check the dates below for each year) during the first three weekends of February, with the float procession taking place on the Sunday afternoons, commencing at 2.30pm. The Sundays of 27 January, and the 3 and 10 February 2013. The route runs from Piazza a Mare along Via Albereta, south along Via Bicocchi, south-west along Via Gorizia, and then along the sea-front along Via Carducci to Piazza a Mare. And around again, and again. 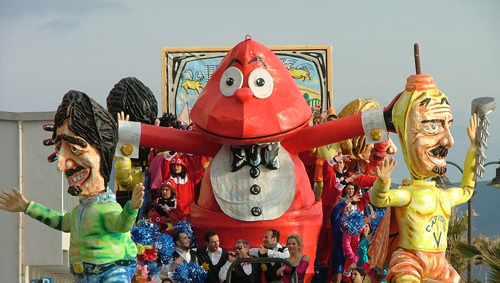 This shorter route - introduced in 2010 - has resulted in a much slower procession, with some fifteen to twenty minutes intervals at times between movements of the floats. So be prepared to take something with you to keep the very young ones amongst your party happy, or to take a stroll along the beach and return. The procession lasts for a couple of hours, ending in Piazza a Mare with the competition for the best float and prettiest girl from the "Rione" - the seven districts of the town. It is great fun for kids and, apart from the cost of the costumes (see below) a relatively cheap day out for the whole family in fresh air. With a great beach to play on before, after or during the event! In the years that I have attended, the weekends have remained dry, and sunny. But just in case the weather isn't great, the carnivale will continue for another weekend, into the beginning of March. 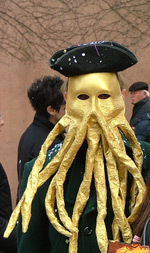 There are a host of other associated events during the three carnival weeks: masked displays and competitions etc. If you are thinking of visiting this part of the Maremman coast in the winter months (it is spectacular in the winter too) and coming along, I suggest you check out the Follonica city website at http://www.carnevalefollonica.it/ (in Italian) for that years particular itinerary etc. 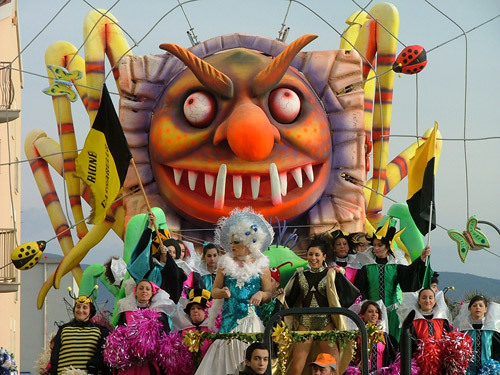 The idea of the carnival was born in 1949 and, as a competition of skill and artistry between the then four quarters of the town, Carnevale Follonichese was held for ten years between 1950 and 1960. After two years of dissatisfaction in the "Rione", it ceased in 1960 and the town remained without a carnival for twenty years. During this time Follonica changed unrecognisably, with the introduction of new industries, a growth in tourism, and large expansion both geographically and in population. The carnival re-commenced in 1979, but as with the changes to the appearance of the town, so too the carnival took on a new look. The original four quarters of "Center", "New Zone", "Senzuno" and "Church", increased in number to seven, with the addition of "167-Live High to the Sea", "Cassarello", and "Capannino-Saint Luigi". The carnival remains self-financing and the rivalry for the prize for the best float is as strong as ever. Work on the construction of these commences in October, with many hours spent by families and friends in the storage yards in the industrial area of the town in the preceeding the four months to the carnival. This year, for the first time, the organisers charged for entry to the carnival route, and perhaps not surprisingly, the numbers of people were down on the year before. The charges were 3 Euros per adult, and free for children. I suspect that it will revert to being completely free. 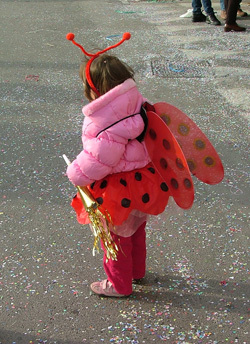 From January onwards the costumes for children may be found in local villages and towns cartoleria (stationer's) and childrens clothes shops. But be aware that they tend to be very pricey. For a more economical choice, the best options are the local Follonica supermarkets, such as the COOP, PAM, and Penny Market etc, plus the household soaps and toiletries outlet, Maurys. Although still not cheap, with prices starting at around a minimum Euros 30 for a small costume. For the greatest choice of designs, buy earlier rather than later. The carnival route is full of walking unlicensed street vendors selling confetti and paper streamers etc. If your kids are pulling at your sleeves for you to buy some, be aware that the prices are very inflated, often double if not more than at the local supermarkets. If you decide how much you want to pay and politely stick to it, chances are you will have happy kids and have saved enough for an ice cream later. There are many outlets in Follonica for gelato, some "artigianale" (handmade/handmade on the premises) and some not. Apart from anything this ice ceam is good for you (in moderation of course!). It is made from whole milk and isn't jammed full of sugar or colourings, and is substantially lower in calories than its mass produced counterpart. There are some wonderful flavours to try amongst the traditional Fiere di Latte and pistacchio .. and even great yoghurt varieties too. So, always look for the "gelato di produzione artigianale" sign. But by far the best, and my choice every time I visit, is the gelataria "Pagni" in Via Biccocchi - right along the carnival route! What could be easier!